How to find words in many text files by typing the path and search term. How to find anything quickly by typing filename patterns and word patterns to search for, with a Freeware tool for Windows and Linux/Mac. to search everywhere, but only in a specific file or files? Below the "find:" mask at the left bottom, you see the "path:" mask. 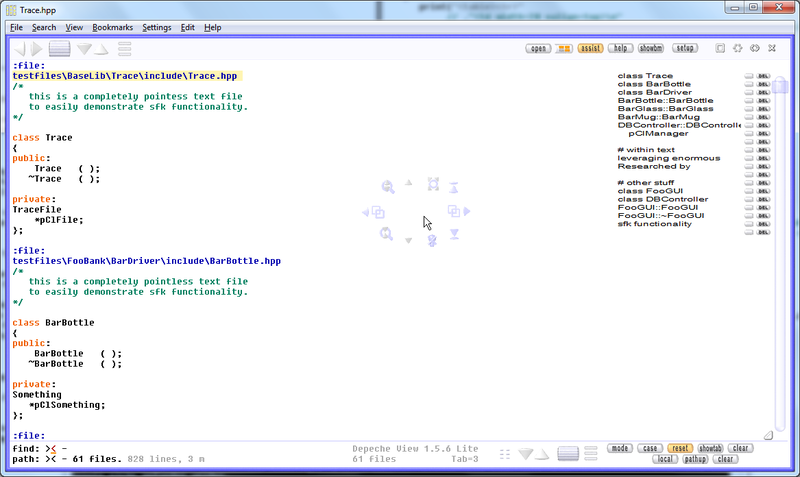 the text content within selected files. By default, whatever you type goes into the FIND mask. Concentrate on it, and spot the orange cursor within. Now press the TAB key. Voila - the cursor is now in the PATH mask. type "help" and you select all files having "help"
in their name, so probably just one file, right now. The path mask is always case insensitive, so "help"
will also find files having "Help" in their name. Now press TAB again - the cursor is back in the FIND mask. is reduced to that files. Enough? Want unlimited search over everything again? and then TAB again to go back to the FIND mask. and it shows only with a non-empty path mask). And why CTRL+M? Because it's next to CTRL+N like narrow. We'll come to that further below. Instead of pressing TAB, you may also change between "find" and "path"
by simply clicking into those masks. -  you do not have to press any hotkey to activate it. the find (or path) mask is always active. just type a word to find it, instantly. just press INSERT, and the whole mask is cleared, instantly. with the least possible effort. -  to copy the mask content to clipboard, CONTROL+click into it. which brings up a Find dialog with classic text fields. -  press CONTROL+N like "narrow to this single file"
and the full path of the current file is copied into the "path:" mask. by moving the mouse up or down. -  OR: press CONTROL+U like "up in the directory tree"
Of course, repeated CTRL+U will step up even further. treating the wildcard like a sublevel in the folder.